...read it and release it. 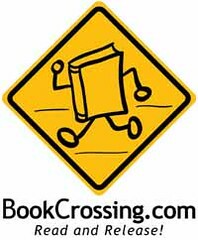 So, I've finally gotten around to registering and releasing some books through BookCrossing.com. With all of my traveling lately, the books I've released (just four) have all been at airports. Which is fine, because that's four more books added to the collection of the Airport Public Library. So far, I like this. It feels so odd to intentionally leave a book somewhere, but it's for a good cause. 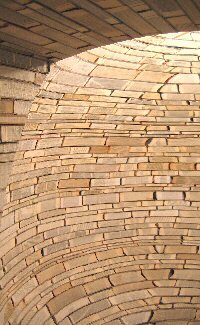 It can be fun, too - like letterboxing and geocaching, the goal is to make the drop without letting anyone see you. At least, that's what's going through my head. Anyway, if you have extra books, give it a try. Incidentally, I did not buy the starter pack (why buy when you can do it yourself?). Instead, I printed out their label template [62kb, pdf] (for inside the cover) and also created another template [5kb, pdf] for the outside of the book cover. And instead of printing these on sticky labels, I just attached them with packing tape. Works just fine, and cost nothing. 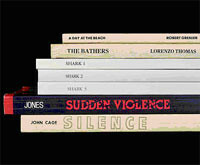 we collect books that are no longer wanted and send them to schools and libraries which desperately need them"
More along the lines of using books in a creative/artistic way, another LISNews post pointed to an artist who arranges books she finds so that the spine titles read as a sentence (see image above). I'd never be able to find anything on the shelf this way, but it'd still be fun. A recent post on LISNews highlighted an article (or here) in the New York Times, which "discusses ways of easing the process of giving away books. Columnist Alina Tugend spoke to her local librarian in Larchmont, NY about their donations and discusses a few other options and strategies to minimize the pain."